President Trump has cancelled the Singapore summit with North Korean leader Kim Jung-Un. He cited North Korea’s “hostility” as the reason, while using language that leaves open room for future reconciliation. North Korea then sent back a respectful letter, which Trump described as “warm and productive.” I expect the situation to continue improving, as both sides seem to want negotiations, despite the malign influence of spoilers like National Security Advisor John Bolton. The media, on the other hand, immediately interpreted Trump’s cancellation and the breakdown of negotiations as proof of North Korea’s bad-faith and intransigence, that it is not serious about its commitments, and that Kim was simply “playing” the victimized US. A little recap of the actual recent events is therefore in order. North Korea has recently made a number of important concessions. It had agreed to halt its missile tests and has made good on that commitment. It also agreed to accept the end-goal of denuclearization as a prerequisite of negotiations. These were the two main preconditions the US was demanding. Furthermore, it recently released a number of US prisoners as a further show of good-will, and has completed the destruction of its only known nuclear test site, which foreign journalists were allowed to witness. It has also pulled-back from its earlier position regarding the US-South Korean military drills, instead accepting that they will take place. The US, in turn, had scaled back the military drills to not include “strategic assets”, meaning nuclear-capable aircraft. As well, it halted its position of enmity against the North. This can be seen in the marked shift from the beginning of the year when tensions were mounting and the threat of nuclear war was over the horizon. In short, North Korea made extension concessions, while the US made extremely minor ones. Essentially, the US halted an already illegitimate posture of threatening to destroy a small nation which poses it no threat, while continuing highly threatening military drills, albeit ones that didn’t come with the threat of nuclear destruction attached. However, there were concessions on both sides and the chance of a possible peace settlement was therefore hopeful. Recently, William J. Perry, who was directly involved in the 1994 negotiations between North Korea and the Clinton administration, described how the success of the current round of negotiations depends on building a mutual “sense of trust” and good faith on both sides. Its important to note that the 1994 negotiations were the first time the US seriously pursued diplomacy with the North, which proved to be the only strategy that has ever yielded results. The US was able to obtain a temporary halt to the North’s nuclear development. When the Bush administration came in and rejected diplomacy in favor of its own brand of “maximum pressure”, the progress was undermined and North Korea went on to obtain nuclear weapons and to further build up its arsenal. How did the administration take Perry’s advice and enhance the “sense of trust” in the face of multiple North Korean good-faith concessions? First, John Bolton, who was a key figure in the Bush administrations derailment of Clinton’s North Korea diplomacy, demanded complete capitulation from North Korea while threatening to destroy the country. In an interview, Bolton said the US was pursuing the “Libya model” for the negotiations. Libya gave up its nuclear program following US pressure, which then freed the US to later attack and destroy the country. Libya is therefore an example of US duplicity and a testament to the necessity of possessing a nuclear deterrent to ward off US aggression. Evoking the “Libya” model was a barely-disguised threat against North Korea and an effort to derail the negotiations. Secondly, the US conducted more threatening military drills along the North’s border, which the US would of course find threatening if similar drills were conducted by Russia or China along the Canadian border. This time, the drills were to include nuclear-capable B-52’s, a reneging of the previous US concession to scale back the drills. According to reports, the original decision to include the B-52’s was done against the will of South Korea, which, if true, exemplifies the neo-colonial relationship the US exerts over its South Korean client, erroneously described as a mutually-beneficial “alliance” in the media. With these moves, the US tarnished the mutual trust and good-faith that had been building, and North Korea responded by denouncing Bolton and threatening to cancel the Trump-Kim summit. The North was taking advantage of how badly Trump wanted the summit to take place; his desire to be seen as “the great statesmen” and a purveyor of world peace, a leader deserving of the Nobel prize. The media responded to North Korea’s letter by proclaiming it was proof of the North’s subterfuge and untrustworthiness, blaming them for the breakdown of trust. The obvious effect of these kinds of narratives being to support state power and provide ideological cover to policies aimed only at power projection; to shield policymakers from scrutiny about what they are actually doing in the world, making aggressive actions seem defensive and justified. In response to North Korea’s denunciation of Bolton and the US’ threats, the administration began to back off. It cancelled the participation of the B-52’s and attempted to roll back comments about the “Libya model.” Trump also walked-back his public demands of complete and immediate denuclearization, saying that a gradual denuclearization was perhaps a possibility. However, at the same time Trump issued a new threat, saying that if no deal was reached the Libya model would be back on and the US would engage in “total decimation” of the country. In short: either make a deal or we’ll murder you. Vice President Pence then doubled-down on this by evoking Trump’s ultimatum while directly threatening the country, saying that if they don’t make a deal it will “end like the Libyan model ended” for them. “Whether the US will meet us at a meeting room or encounter us at nuclear-to-nuclear showdown is entirely dependent upon the decision and behavior of the United States,” North Korea’s vice foreign minister wrote. Not mentioned was how the US had threatened to “totally decimate” their country first, the North’s response therefore being incredibly mild. Also not mentioned was how North Korea has a no-first-use nuclear policy while the US maintains the right to a first strike. Nor that the entire reason for the North even having nukes in the first place is to ward off a US attack, a position that is only further justified by continued US threats and intransigence. North Korea essentially responded by saying: we’ll accept negotiations, not demands and threats. So if you’d like to go back to threatening us with nuclear destruction, then we’ll respond without backing down. So, while North Korea employs vitriolic and insulting language, in actuality their position is entirely understandable and has remained consistent throughout the years. The core issue of the entire North Korea situation is, and has been, the threat of US attack. The US divided Korea in pure colonial fashion. It “decimated” its population during the Korean War, burning down “every town in North Korea” while erasing at least 13.5% of its population. It followed this with economic and political strangulation, which is partly responsible for the starvation and famine that has transpired throughout the country’s history, as is conceded in the internal US record. Throughout all of this, the US maintained a posture of threatening hostility against the North, repeatedly threatening them with nuclear attack. In response to this existential threat, North Korea developed a nuclear arsenal as a deterrent to US aggression. This has repeatedly been the assessment of US intelligence, and was recently reiterated by James Clapper, the former director of national intelligence. 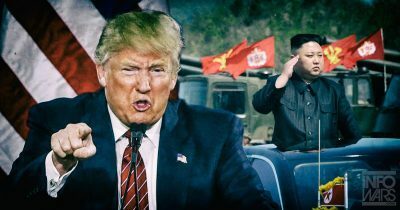 The position of the US during the negotiations has been one of demanding that North Korea give up its only means of defense against US aggression. When officials evoke the “Libya model” or demand full denuclearization as a prerequisite, they are demanding that North Korea give up its defenses without any recognition of the country’s legitimate security concerns; that it essentially bow on its knees in complete capitulation to US diktats, which would likely mean the eventual destruction of its country. It may not seem like much to us in America that our government decimated their population during the Korean War, or that their nation is under existential threat from US power, but it means something to North Koreans. Although Western pundits and analysts in effect have no skin in the game one way or the other – the only way the US is threatened by North Korea is if it launches an attack against them first, provoking a defensive response – for North Koreans and people living on the Korean peninsula it is a matter of life and death, especially when US policymakers threaten their security by making threats, ultimatums, and attempting to fly nuclear-capable aircraft along the peninsula. Yet for the ideological indoctrinators who service state power, i.e. journalists and “experts”, nothing short of complete North Korean capitulation is acceptable. Anything less and its “proof” of North Korean subterfuge, intransigence, and deviousness. It is literally unsayable to discuss the relevant history and the core root of the problem. It cannot be said that the US is the aggressor, that the threat of US aggression is the main reason behind North Korea’s nuclear deterrent. These blasphemies contradict the ideological doctrines that the US is always defensive, that it always has the right to threaten or use force and violence against the world, while the world does not have the right to defend themselves against it. So, while the system of propaganda—commonly referred to as the “free press”—will do everything in its power to back up Trump’s claim of the US simply responding to North Korean “hostility”, the reality shows something entirely different. This article was originally published on Reports from Underground.